Following the funeral on Saturday of murdered shopkeeper Mr Asad Shah of Glasgow, the Ahmadiyya Muslim Community UK has called for urgent action by the Government to tackle the undercurrents of radicalisation in the UK. Mr Shah, a member of the peace-loving Ahmadiyya Muslim Community was killed on 24 March, described by police to be a religiously motivated murder by a Muslim. 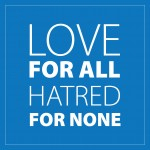 The Ahmadiyya Muslim Community UK has been shocked by this brutal attack and has expressed its concern that this reflects the impact of growing intolerance and anti-Ahmadi hate in the UK. It notes that whilst this is being promoted by a tiny minority it is having a negative and divisive impact and the murder of Mr Asad Shah is a wakeup call for the Government and authorities to take urgent and decisive action. The Ahmadiyya Muslim Community has faced decades of persecution in Pakistan where extremists preached hate against the community and the Pakistan Government’s failure to reign in the terrorists has seen such hate increase and target other communities as well. “The horrific killing of Mr Shah is heart wrenching. We have been warning about the signs of hate being preached in the UK for many years and our concern is that if left unchecked it will grow and destroy the harmony of our society. “There must be no tolerance of intolerance and all leaders at every level of society and in all spheres of life must take a principled stand against such extremism. It must not be acceptable to turn a blind eye to the promotion of hate by labelling people apostates and deeming them to be worthy of death simply because you have different beliefs or understandings. “We have seen such hate and prejudice surface against our community on satellite television in the UK, in mosques, schools and even in local government. We are a peace loving community and will never strike back, for Islam teaches us to pray and persevere if we are to achieve lasting peace. However, in Pakistan we have seen how extremism spreads from targeting and killing Ahmadis to targeting and killing others, as evidenced by deadly attack on Christians in Lahore this Easter Sunday, and this must not be allowed to happen here. The Ahmadiyya Muslim community expressed its sincere appreciation to the people of Glasgow who have held vigils and raised funds in the memory of Mr Shah. As a visible sign of solidarity with the Scottish people, against intolerance and extremism, Ahmadiyya Muslim Community has sponsored 100 buses to run in Glasgow, Edinburgh and Dundee for two weeks starting 11th April.